2002-04-03. Good. Ships with Tracking Number! INTERNATIONAL WORLDWIDE Shipping available. May not contain Access Codes or Supplements. May be ex-library. Shipping & Handling by region. Buy with confidence, excellent customer service! New York: Hurd & Houghton. 1868. Beautiful green/gilt dec cloth; Near fine, ep inscription & crease, minor wear, bright & lovely. .
2010-09-08. New. Ships with Tracking Number! INTERNATIONAL WORLDWIDE Shipping available. Buy with confidence, excellent customer service! 2013-01-15. Good. Ships with Tracking Number! INTERNATIONAL WORLDWIDE Shipping available. May not contain Access Codes or Supplements. May be ex-library. Shipping & Handling by region. Buy with confidence, excellent customer service! 2017-03-11. Good. Ships with Tracking Number! INTERNATIONAL WORLDWIDE Shipping available. May not contain Access Codes or Supplements. May be ex-library. Shipping & Handling by region. Buy with confidence, excellent customer service! 2014-09-24. New. Ships with Tracking Number! INTERNATIONAL WORLDWIDE Shipping available. Buy with confidence, excellent customer service! 2017-11-03. Good. Ships with Tracking Number! INTERNATIONAL WORLDWIDE Shipping available. May not contain Access Codes or Supplements. May be ex-library. Shipping & Handling by region. Buy with confidence, excellent customer service! IndyPublish. PAPERBACK. 1404329730 **Never used** copy, hardcover with no dust jacket as issued, contents in unmarked EXCELLENT condition; ships USPS with delivery confirmation in US 613W . Very Good. HAWTHORNE, Nathaniel. THE SNOW-IMAGE: A Childish Miracle. With a Prefatory Note by Herbert Ross Brown. Portland:: The Bradford Press,, 1934. First separate edition thus, by this publisher and with prefatory note by Herbert Ross Brown, limited to 300 numbered copies [Clark A19. 26 "prints title story only"]. . Bookplate of James West on front pastedown (husband of author Mary McCarthy), very slight foxing to fore-edge of a few pages, else a fine copy in publisher's paper-covered box (with printed paper cover label). Publisher's box is slightly dust soiled, moderate wear with few short tears to edges, ink rubberstamp on verso of bottom lid of box which states: "So this, my good Sabinus, is The One record of Our great Love, this little stone," else very good. . Octavo, white cloth spine, paper-covered boards, pp. xii, 37, top edge gilt. New York: James G. Gregory, 1864. Hardcover. Otherwise very good condition. 1st separate edition with "G. A. Alvord, Stereotyper and printer" on verso of title page. There is a later issue in which the printer is not recorded on the verso of title page. 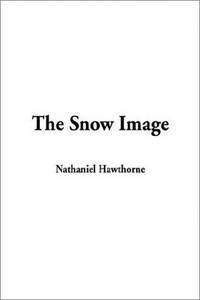 8vo, 31pp, engraved title & 5 delightful colored illustrations of children playing in the snow by Marcus Waterman. Original publisher's green gilt decorated cloth, a slt. later black & gilt label on the spine reads "The Snow Image". Very slt. edgewear at corners, otherwise a very nice copy. Ink inscription in period hand, dated 1864. BAL 7660, Clarke A19.4. Walter Scott Ltd, 1851-01-01. Hardcover. Good. 1st ed. Bound in contemporary 1/4 leather over marbled boards. Hardcover. Front board nearly detached. In mylar jacket. vi, 176 pages ; 19 cm. Clean, unmarked pages. BAL7605. Contents: The snow-image.--The great stone face.--Main-street.--Ethan Brand.--A bell's biography.--Sylph Etherege.--The Canterbury pilgrims.--Old news.--The man of Adamant.--The devil in manuscript.--John Inglefield's thanksgiving.--Old Ticonderoga.--The wives of the dead.--Little Daffydowndilly.--My kinsman, Major Molineux. IndyPublish.com, 01/05/2006. Hardcover. Collectible - Acceptable. No inscriptions, pages good, although yellowed. No dust jacket, Published by Buist, Cunningham & Co. (No date). James G. Gregory, 1864. Hardcover . Good. Originally printed in "Twice Told Tales". This is the first stand alone printing. Book has been well-loved. Binding is cracked at the title page. Text block otherwise tight. Foxing throughout. Moisture stain to bottom corner throughout pages. Boards have some wear and bump. Frontis foxed but tissue is still in place. Writing on rear endpaper in pencil. Still a pretty solid copy! 2018. Leather Bound. New. Leather Binding on Spine and Corners with Golden Leaf Printing on round Spine (extra customization on request like complete leather, Golden Screen printing in Front, Color Leather, Colored book etc.) Reprinted in 2018 with the help of original edition published long back . This book is printed in black & white, sewing binding for longer life, Printed on high quality Paper, re-sized as per Current standards, professionally processed without changing its contents. As these are old books, we processed each page manually and make them readable but in some cases some pages which are blur or missing or black spots. If it is multi volume set, then it is only single volume. We expect that you will understand our compulsion in these books. We found this book important for the readers who want to know more about our old treasure so we brought it back to the shelves. Hope you will like it and give your comments and suggestions. Lang: - eng, Pages 894. EXTRA 10 DAYS APART FROM THE NORMAL SHIPPING PERIOD WILL BE REQUIRED FOR LEATHER BOUND BOOKS. COMPLETE LEATHER WILL COST YOU EXTRA US$ 25 APART FROM THE LEATHER BOUND BOOKS. Linz: Osterreichischer Verlag fur Belletristik und Wissenschaft, 1946. Book. Very Good. Original Wraps. 8vo - over 7¾" - 9¾" tall. Good.. 39 p. Englische Lesehefte, Heft Nr. 2. Minor stains to cover. Text is English and German..
2019. Leather Bound. New. Leather Binding on Spine and Corners with Golden Leaf Printing on round Spine (extra customization on request like complete leather, Golden Screen printing in Front, Color Leather, Colored book etc.) Reprinted in 2019 with the help of original edition published long back . This book is printed in black & white, sewing binding for longer life, Printed on high quality Paper, re-sized as per Current standards, professionally processed without changing its contents. As these are old books, we processed each page manually and make them readable but in some cases some pages which are blur or missing or black spots. If it is multi volume set, then it is only single volume, if you wish to order a specific or all the volumes you may contact us. We expect that you will understand our compulsion in these books. We found this book important for the readers who want to know more about our old treasure so we brought it back to the shelves. Hope you will like it and give your comments and suggestions. Lang: - English, Pages 366. EXTRA 10 DAYS APART FROM THE NORMAL SHIPPING PERIOD WILL BE REQUIRED FOR LEATHER BOUND BOOKS. COMPLETE LEATHER WILL COST YOU EXTRA US$ 25 APART FROM THE LEATHER BOUND BOOKS. 2019. Leather Bound. New. Leather Binding on Spine and Corners with Golden Leaf Printing on round Spine (extra customization on request like complete leather, Golden Screen printing in Front, Color Leather, Colored book etc.) Reprinted in 2019 with the help of original edition published long back . This book is printed in black & white, sewing binding for longer life, Printed on high quality Paper, re-sized as per Current standards, professionally processed without changing its contents. As these are old books, we processed each page manually and make them readable but in some cases some pages which are blur or missing or black spots. If it is multi volume set, then it is only single volume, if you wish to order a specific or all the volumes you may contact us. We expect that you will understand our compulsion in these books. We found this book important for the readers who want to know more about our old treasure so we brought it back to the shelves. Hope you will like it and give your comments and suggestions. Lang: - eng, Pages 272. EXTRA 10 DAYS APART FROM THE NORMAL SHIPPING PERIOD WILL BE REQUIRED FOR LEATHER BOUND BOOKS. COMPLETE LEATHER WILL COST YOU EXTRA US$ 25 APART FROM THE LEATHER BOUND BOOKS.